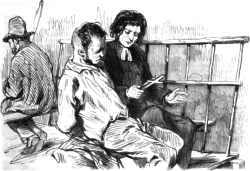 On an unspecified date around this time in the late 1820s, the narrator of Victor Hugo’s Last Day of a Condemned Man leaves off his diary — bound for the guillotine. An illustration from The Last Day of a Condemned Man. The young Hugo‘s first major work of fiction, this 1829 story dramatizes the torment of an unnamed man doomed for an unstated crime. By abstracting its central character, Hugo generalizes its unabashed anti-death penalty message … but one of the few morsels of specificity places the man’s conviction on “a beautiful morning at the close of August,” with the action unfolding over the ensuing six weeks until his date with the guillotine. If not exactly Hugo’s greatest work, this emotional rendering of a man’s anguish awaiting death well befits an artist deeply sensitive to the passion of the scaffold — and a period when many writers witnessed, critiqued, contested, and even faced the phenomenon of public execution. They say that it is nothing,–that one does not suffer; that it is an easy death. Ah! then, what do they call this agony of six weeks,–this summing-up in one day? What, then, is the anguish of this irreparable day, which is passing so slowly and yet so fast? What is this ladder of tortures which terminates in the scaffold? Are they not the same convulsions whether life is taken away drop by drop, or intellect extinguished thought by thought? Now I must fortify myself, and think firmly of the Executioner, the cart, the gendarmes, the crowd in the street and the windows. I have still an hour to familiarize myself with these ideas. All the people will laugh and clap their hands, and applaud; yet among those men, now free, unknown to jailors, and who run with joy to an execution,–in that throng there is more than one man destined to follow me sooner or later, on the scaffold. More than one who is here to-day on my account, will come hereafter on his own. 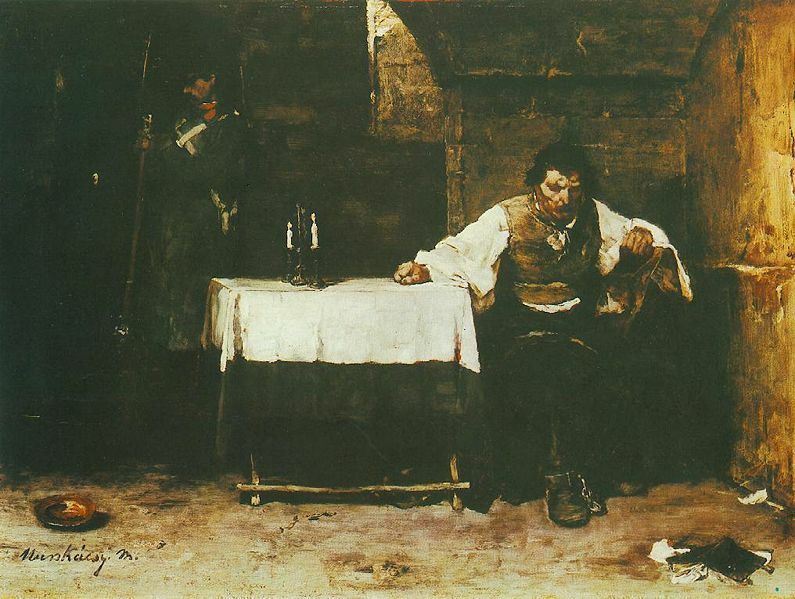 Hungarian painter Mihaly Munkacsy‘s The Last Day of a Condemned Man has no relationship to Hugo’s book, but deals in a similar mood. It won an award from the Paris salon in 1870. The Last Day of a Condemned Man is available free online (English | French), or in throwback print form from Amazon.com. * The prisoner finds in his cell the names of then-notable criminals who previously occupied it — a concession to period specificity. The last of these names is Castaing, meaning our man’s story takes place after that poisoner’s 1823 beheading. A subsequent reference to Louis-Auguste Papavoine, executed in 1825, would push the execution to the even narrower window of October 1825, 1826, 1827, or 1828.